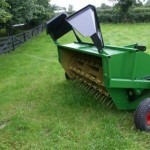 SWARTH WILTERwill aid farmers in improving the quality of grass, hay and straw by gently turning, lifting and aerating the material giving a higher swarth and helping the farmer get the most from short spells of fine weather. This leads to a better quality of hay, silage or straw; and therefore a better quality of feed. The swarther has a strong, robust design which is built to suit Irish conditions. Turning and aerating of the swarth improves its quality and the quality of the feed. 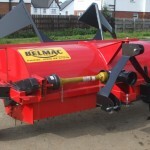 It’s driven by a chain which eleminates the need to replace belts and any belt slippage. It has a self lubricating oiler on the chain which ensures that the chain is constantly lubricated. It has heavy duty reinforced bearings which ensure stability of the rotar. The robust flexible tines are mounted on a heavy duty rotar and shaft to withstand the tough Irish conditions. 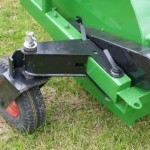 It has inline swivel wheels with rotar which prevents the rotar from hitting the ground in rough conditions. The wheels are free turning and height is adjustable. It has adjustable back doors to alter the width or direction of swarth.